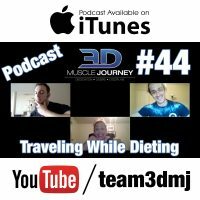 Although traveling while dieting isn’t ideal, it’s not always avoidable. This week Eric, Andrea and Alberto sit down to talk about things one can do while traveling, to help them stay on track with their protocol. The group further subdivides this topic into three main categories: those who have a lot of weight to lose, those who are cutting for summer or for some other flexible deadline, and those who are actively engaged in contest-prep dieting. What is a good mindset to have when traveling, to help take one’s focus off food? What is a good approach to dieting for a wedding or vacation? What strategies and tactics can you use to help you stay on track with your nutrition and training, to the level that you need to, for your current goals? All of this plus much, much more, is covered in today’s information-packed podcast. now my question is, i couldnt book the hotel, so there is no kitchen in here, and its a 14 day trip/wedding/ family outing.